When I’m having stressful days the thing that grounds me most is the cooking when I come home. In fact, this is what I’m looking forward to. The time I spent in the kitchen – and funnily enough especially the ‘annoying’ chopping-up bit – is not wasted time to me, but relaxing in itself. For others it might be hitting a punchbag in the gym or the evening yoga class (I do like that too), for me it’s the process of the cooking more than enjoying dinner that does the trick. So while I really love the idea of leftovers waiting in the fridge (the absolute best thing to avoid unhealthy ‘quick-fixes’ on your way home! ), I’m sometimes a little sad, I’m not getting to spent some more time in kitchen. However, facing a deadline and living with a constant guilty conscience, because one should devote ALL the time there is to this one damn thing (but never does), even I had to give in and embrace cooking in batches. And since I love making pestos, hummus and other condiments I’ve got lots of different flavour options for easy things such as roasted veggies, eggs in various ways or one-skillet meals that I make during the week. 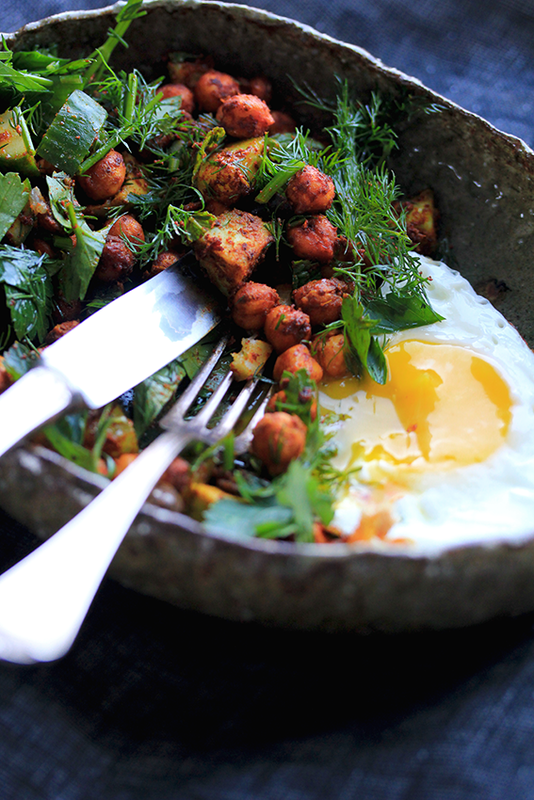 One of my favourite ‘snacks’ (I often have it instead of a ‘proper’ meal) are VERY spicy roasted chickpeas. And this is where another batch cooking comes in handy: I soak huge amounts of pulses ( in this case chickpeas) over night in water with some kefir added (or apple cider vinegar for a vegan option), cook them, freeze most of them and use the rest straight away for hummus, in stews, curries or salads. While these roasted chickpeas are delicious on their own (actually they’re dangerously addictive) making a salad out of them turns them into a real meal that is a satisfying, super quick lunch or dinner option that also keeps well in the fridge, is a crowd pleaser and great for picnics and potlucks (well, in summer at least…) since the herbs don’t wilt as quickly as salad leaves. This is just a basic recipe. The great thing is, that it is incredibly versatile and you can add on whatever you’ve got at hand. Too good to be true? Well, you tell me. Preheat the oven to 200°C. In a pan without oil roast the whole cumin and coriander seeds. Grind with a mortar and pestle. Melt the coconut oil in the same pan. Place chickpeas in a bowl, add all spices and the oil. Mix well, so that all the chickpeas are coated with the spice mixture. Place chickpeas on a baking tray and roast in the oven for about 20-25 minutes. They should become slightly crunchy, but be careful not to burn them. Meanwhile chop up all the herbs, the cucumber, preserved lemon, olives an whatever add ons you might be using. Mix the roasted chickpeas in a large salad bowl with all the other ingredients, drizzle with lemon juice, olive oil (be generous) and salt to taste. Serve with egg or yoghurt if you feel like it. Voilà!